The Equinox Bundles component is tasked with implementing all add-on services detailed in the OSGi specifications including the output of the various OSGi Expert groups. For example, the Core Platform, Enterprise and Mobile Expert Groups. In addition, the bundles component team defines and produces bundles and services that are of general utility to OSGi systems and programmers. For example, the Bundles team is responsible for the Extenstion registry used throughout Eclipse. The Bundles component consists of several "projects" in the Equinox bundles git repository (see the resources page for information on repository location and access). In general the name of the project matches the symbolic name of the resultant bundle. An implementation of the OSGi R4 MEG Application Container service. A library of utility classes (e.g., IStatus, Assert, IAdaptable, ...) that are frequently used by Eclipse bundles. This bundle can be used in various different OSGi systems or standalone (i.e., without OSGi). An implementation of the OSGi R4 Configuration Admin service. An implementation of the OSGi R4 Device Access service. This service provides automatic detection of attached and detached hardware devices and can automatically download and start appropriate device drivers. An implementation of the OSGi R4 Declarative Services specification. This service simplifies the task of authoring OSGi services by performing the work of registering the service and handling service dependencies. This minimizes the amount of code a programmer has to write; it also allows service components to be loaded only when they are needed. An implementation of the OSGi R4 Event Admin Service. This service provides an inter-bundle communication mechanism based on an event publish and subscribe model, popular in many message-based systems. An implementation of the OSGi R4 HTTP service. This service provides an embedded HTTP server that is capable of serving HTML and Java servlets. The org.eclipse.equinox.http bundle was deprecated as of Eclipse 3.8 Juno in favor of org.eclipse.equinox.http.jetty and is no longer shipped. An implementation of the OSGi R4 IO Connector Service. This service adopts the javax.microedition.io packages as a basic communications infrastructure. This specification defines a service that adopts the flexible model of the Connector framework in J2ME, but allows OSGi bundles to extend it. An implementation of the OSGi R4 Initial Provisioning. This service Defines how the Management Agent can make its way to the Service Platform, and gives a structured view of the problems and their corresponding resolution methods. An implementation of the OSGi R4 Log service. This service provides a general-purpose message logger for the OSGi environment. In the Indigo (3.7) release the Equinox log service was integrated directly into the core framework. This bundle is no longer needed if you are using the 3.7 or greater Equinox Framework. An implementation of the OSGi R4 Metatype service. This service defines interfaces that allow bundle developers to describe attribute types in a computer readable form using so-called metadata. It allows services to specify the type of information of data that they can use as arguments. The Eclipse preference service is an extension of the standard OSGi preference service that adds listeners and the notion of preference scopes. The Eclipse extension registry allows bundles to communicate and cooperate using declarative markup and lazy instantiation. The extension mechanism is similar to OSGi services and declarative services but has some different contractual and management characteristics. A library that includes a very small number of types normally supplied by the Equinox implementation. This JAR is useful when running certain bundles outside of Equinox or outside of OSGi altogether. This bundle is not needed when running inside Equinox. An implementation of the OSGi R4 User Admin Service. This service provides support for users, groups, and limited authentication functionality. An implementation of the OSGi R4 Wire Admin Service. This is an administrative service that is used to control a wiring topology in the OSGi Service Platform. It is intended to be used by user interfaces or management programs that control the wiring of services in an OSGi Service Platform. 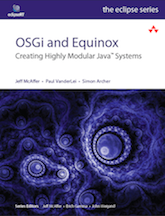 A library of utility classes that are frequently used the Equinox OSGi Service implementation bundles. This bundle contains the set of OSGi specified service APIs. It is included here as a convenience for people developing or deploying service implementations independent of their specification. This bundle contains the set of OSGi specified utilities (e.g., ServiceTracker). It is included here as a convenience. orange - bundle has been deprecated. The team typically develops using Eclipse itself with eGit installed so getting and managing the projects is quite straightforward. Simply start Eclipse, and use Import > Git > Projects from Git. Enter the repo access information and choose the projects you want to load into the workspace. If you are working without Eclipse (gads! :-) then use your favorite git client and check out the relevant repositories. The specifications for the services are available from the OSGi web site. Click here to download them. The following people are committers on the Equinox bundles component.